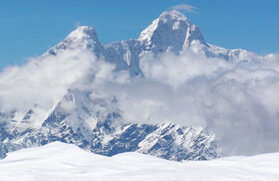 Looming at an elevation of 6,191 meters in the Kumaon Himalayan horizon, the Adi Kailash Peak is one of the scared peaks in the Indian Himalayan region as the pattern of snow deposition on it takes the shape of "OM". Further, the appearance of the massif resembles Mount Kailash, which lies at an elevation of 6,638 meters, in Tibet. Adi Kailash, also known as Om Parvat, has several other names like Little Kailash, Jonglingpong Peak, Baba Kailash and Chhota Kailash. 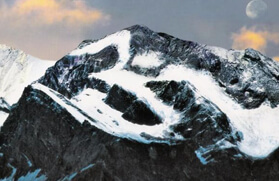 The summit of Om Parvat still remains virgin due to its sacred nature BUT the first attempt to climb the peak was done by an Indo - British team in the late 19th century and later followed by another group in 2004. Located on its base, Lake Parvati at an altitude of approximately 4,500 meters is often considered as a holy lake by several Hindu pilgrims. The trek to Adi Kailash Base Camp traverses through a rich valley, which is embellished with several tribal villages, cultivating lands and wide range of flora and fauna at different altitude, and cuts through several small streams. If you are lucky enough then you might also get a glimpse of the Annapurna Peak, which lies at an elevation of 8,091 meters in Nepal. The Adi Kailash trek that stretches from an elevation of 2,200 meters to 4,752 meters is one of the challenging treks in the Kumaon Himalayan region that woos the soul of several trekkers. 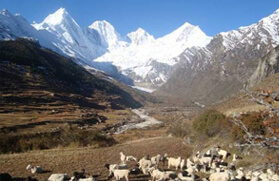 Usually, the trek is carried out between June to October from the vivid Dharchula. This is the best time to see the dot on the semicircular part of the OM symbol. The trail then leads us to Lakhanpur from where we would trek to the next spot which is Lamari. After a night stay at this point, we would then proceed towards Budi. From this place, the trek becomes more challenging as it gets steep. Our next stop from Budi will be Nabi. There will be a night stay in this place and then a jeep ride would take us through Nampa to the Kutti village, where we would enjoy the nature walk as well as the stay in the village for one complete night. Through Sungchuma we will head towards Jollingkong from where we can get the Adi Kailash Darshan. Jollingkong is the highest point of our trek, after reaching here we can offer prayers in the temple, and also sightseeing the Gaurikund Lake. Tour My India will provide you the best of experience during your trip to Adi Kailash by helping you at every step. We ensure to provide the best of the services that are available during your complete trek. The Adi Kailash trek is approximately of 11-12 days of trail depending on fitness level. Being one of the alpine treks in the Indian Himalayan belt, it is recommended that one should at least have prior trekking experience. The best time to hit the track to the base of Adi Kailash is during the summer and autumn season. Our journey starts at 10:00 PM from Old Delhi train station by taking a train or Volvo Bus to Kathgodam/Haldwani. After reaching our destination at around 5-6 AM in next morning, we will take a tempo/jeep to cover the rest of the grounds to Pithoragarh. While our journey from Haldwani/Kathgodam to Pithoragarh we will have a stoppage near Bhimtal for Breakfast, then in Daniya for lunch. We would reach our destination in the evening and check in hotel followed by tea/Snacks.Dinner and overnight stay in hotel. After freshening up and having the breakfast in the hotel we will be leaving to Dharchula which is 100 kms from Pithoragarh and takes about 4 hours of jeep drive. With a hotel already booked at our destination the Lunch, tea and Dinner will be served at the hotel in Dharchula. We will leave our hotel in Dharchula early in the morning and take a road trip of 50 kms to Pangla/Lakhanpur and have our breakfast there. After reaching Pangla our breakfast will be served and right after having the meal we will leave for the 9 kms trek to Lamari. Lunch will be served on the way at Malpa, the tea and dinner at Lamari. There will be a comfortable stay all ready for your night to be in the best possible way it could be. The 5 kms trek to Budi will start in the morning right after the breakfast with some snacks.At Budi we can get a gypsy (if we are lucky), else trekking is the only option. There is a steep trek of 4 kms to Chialekh. After reaching here there will be a gypsy ride covering 14 kms but if we get picked by the gypsy at Budi itself then we get to enjoy the ride for 18 kms. We will have our lunch at Chialekh, tea and dinner will be given at Nabi where there would be a warm homestay waiting for us. After having breakfast at Nabi there is a 14 kms long gypsy ride awaiting which takes about an hour to get completed on an average. The ending point of this ride is Nampa where we will have our snacks just after there will be a trek of about 6 kms. This trek will terminate at the Kutti village where our lunch, tea and dinner will be served. With all the comforts available we will have our stay in the house of this old village. The next day, after having snacks at Kutti our trip starts with the Alpine trek which is about 14 kms(It is advised to use horse for aged people). Our breakfast will be served at a point named Sumchuma after which our trek to Jollingkong will resume. Jollingkong being our termination point of the day's trek will give us accommodation in tents with our lunch, tea and dinner as well. One can have the Adi Kailash Darshan from here. Today after having early snacks we can offer prayers in the temple which is located on the bank of Parvati Sarovar and perform the parikrama of the lake. Note: One can also visit Gaurikund which is just 4 kms from here. We will be returning to our camps after our prayers and after having our brunch we will trek back to Kutti village. On our way back there will be snacktime in Sumchuma but the tea and dinner will be served at Kutti village itself in the home stay. We would have to move to Kalapani for a night stay incase government does not allow our vehicle beyond Kalapani. (this happens in rare case.) Nabi will be our host for lunch, tea and dinner. We will stay here, and you can take a stroll in the nearby village. Today we will travel to Nabidang to visit OM Parvat which is about 22 kms by gypsy and after this we will also visit the Kalapani temple on our way back. Kalapani will host our breakfast and lunch, tea and dinner will be served at Nabi. After having breakfast in Nabi, we will drive to Chialekh/budi and from here trek to Lamari. Our lunch and tea will be served at Lamiri/Malpa. Dinner and overnight stay. Breakfast will be served in Lamiri prior of the trek to Lakhanpur. We will be energised with some snacks in Lakhanpur later to which we will be taken to Dharchula via jeep. Dinner and overnight stay in Dharchula. Starting our day early we will have our breakfast in Ogla, Lunch in Daniya and tea in Bhimtal.We would take an overnight train/Volvo to Delhi after having our dinner in Kathgodam/Haldwani. Arrival Delhi next morning in between 05:00 - 06:00 am.